Among the Church’s feasts, there are three in honor of God’s saint which in their significance stand out from the others devoted to the saints and are numbered among the great feasts of the Church of Christ. These feasts glorify the economy of God for our salvation. The announcement of the holy Archangel Gabriel to Zacharias in the Temple begins the New Testament Gospel. The announcement of the same Archangel Gabriel six months later in Nazareth to the Virgin Mary concerning the birth from Her of the Son of God, Who was to be- come incarnate, is a continuation of the revelation of the Pre-eternal Counsel concerning the salvation of the human race. Three months after, the Annunciation, St. John the Forerunner was born “in a city of Judah,” and six months after him Christ Himself was born in Bethlehem. These events are closely bound together. “The glorious conception of the Forerunner proclaimeth beforehand the King Who is to be born of a Virgin” (Exapostilarion, Sept. 23, Feast of the Conception of John the Baptist). The announcement of the Archangel Gabriel in the Temple, announced later to all living nearby by Zacharias, in the magnificent hymn, which he sang after the birth of the child, John and the restoration to him of the gift of speech (Luke 1:67-79), is the forerunner of the angelic hymn: “Glory to God in the highest;” which was sung in Bethlehem by the angels when they announced to the shepherds the Nativity of Christ. From the day of the Nativity of John the Forerunner, the preparation of the human race begins for meeting the Son of God on earth. “Blessed be the Lord God of Israel; for He hath visited and redeemed His people . . . And thou, child, shalt be called the prophet of the Most High: for thou shalt go before the face of the Lord to prepare His ways” (Lk 1:68, 76). These God-inspired words of the priest Zacharias, after he had regained the gift of speech, were made known in all the land of Judea, causing disturbance to all living there, who asked each other in astonishment: “What manner of child shall this be?” (Lk 1:66). Involuntarily the thought arose: Is this not the Messiah Himself? Judea was in an especially tense state of expectation of the Savior. Thus, the child John prepared the way for the Lord by his very birth; and even while he was still in the womb of His mother, by his leaping (Luke 1:41) he announced the coming birth of the Child Jesus, as if crying out: “Christ is born, give ye glory. Christ comes from heaven, meet ye Him” (Irmos, Canticle One of the Canon, Feast of the Nativity of Christ). Being born exactly half a year before Christ, John the Forerunner by the exact time of his birth depicted his mission of preparing the way for the Lord. He was born at the time of the year (June 24) when the day begins to grow shorter after the summer solstice, whereas the Nativity of Christ occurs (December 25) when the day begins to grow longer after the winter solstice. These facts are an embodiment of the words spoken later, by the Forerunner, after the beginning of Christ’s preaching: He must increase, but I must decrease (John 3:30). “The herald of the Sun, the Forerunner” was John the Baptist, who was like the morning star that announces the rising of the Sun of Righteousness in the East. 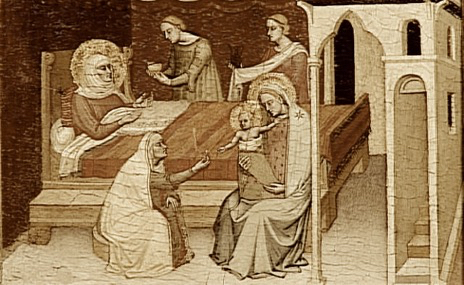 Just as the very event of the Nativity of John the Baptist was the antechamber of the Nativity of our Lord Jesus Christ, so also the feast of the Nativity of John the Forerunner is also the antechamber of the feast of the Nativity of Christ. The star of stars, the Forerunner, is born on earth today, from a barren womb, John the beloved of God, and manifests the dawning of Christ, the Orient from on high (Glory at Lauds, of the Feast, June 24). The whole creation rejoiceth at thy divine nativity: for thou wast shown forth as an earthly angel, O Forerunner and a heavenly man, proclaiming to us, the God of heaven incarnate (Canticle Five of the Canon). O Prophet and Forerunner of the coming of Christ, we who venerate thee with love, are in perplex- ity how worthily to praise thee; for the barrenness of her who bore thee and the dumbness of thy father are loosed by thy glorious and precious nativity, and the incarnation of the Son of God is preached to the world (Troparion of the Feast).